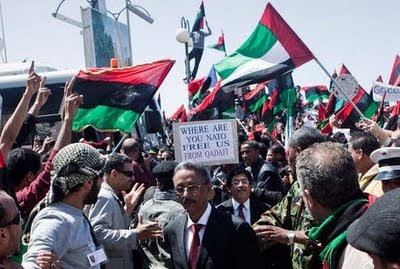 The hand-lettered sign reading "Where Are You NATO - Free Us From Qaddafi" in this New York Times photo by Bryan Denton underscores part of the problem in what has become a stalemate in Libya. The opposition fighters are relying on NATO air power to help them remove entrenched leader Mu'amar al-Qadhafi from power. It doesn't work that way. Using NATO, the North Atlantic Treaty Organization, to enforce a no-fly zone over Libya and protect civilians from attacks by government forces as provided for in United Nations Security Council Resolution 1973 sounds like a good idea, but in reality may not be. There are two major problems here. First, the UN resolution does not specifically call for the removal of Qadhafi. President Barack Obama also clarified that the removal of Qadhafi is not an objective of American military forces supporting the operation, despite it being a stated U.S. foreign policy objective that Qadhafi must step down. Without the removal of Qadhafi as an objective of the operation, NATO will be hard-pressed to support the rebels effectively. Technically, NATO pilots are only there to prevent the killing of civilians, not to provide close air support to the opposition. The second problem is that the United States has foregone its traditional leadership role in NATO military operations over and near Libya. (See my earlier piece, Libya and the abdication of leadership.) Without the United States in the lead role, NATO will be hard-pressed to carry out its mission. Already we are seeing the current situation in Libya described as a stalemate. NATO forces as currently constituted might, and that is not certain, be able to stop Libyan government forces from completely crushing the rebels. Libya may not have effective armed forces, but with their superior firepower and military organization. they are capable of inflicting heavy casualties on the lightly-armed and inexperienced opposition fighters. Complicating the situation is the demand by the opposition that no foreign forces have "boots on the ground" in Libya. This is short-sighted to say the least. NATO pilots in high-performance aircraft moving at high speeds and maneuvering to avoid any remaining air defenses* often have a hard time distinguishing pro-Qadhafi troops from opposition forces, especially at night when they use night-vision devices. There have been at least two incidents of friendly fire when NATO aircraft have mistakenly attacked opposition forces and killed 12 of their fighters. The opposition continues to appeal to NATO to increase its air operations against pro-Qadhafi forces, almost to the point of complaining that NATO is not pursuing the operation as aggressively as the initial coalition prior to NATO taking over command and control eight days ago. That observation is likely true. To expect NATO, basically "war by committee" to act as aggressively as military forces from the United States, United Kingdom and France is unrealistic. Anyone monitoring Malta's air traffic control system that manages the airspace through which most NATO aircraft must transit to and from their operations, would have noticed a significant lessening of military air traffic since NATO assumed command of the operation. The rebels seem to have found allies for their demands in the governments of the UK and France. Both nations have called on NATO to intensify air strikes against Libyan government forces. NATO responded to the thinly-veiled criticism with an official statement: "NATO is conducting its military operations in Libya with vigor within the current mandate. The pace of the operations is determined by the need to protect the population." While President Obama may not feel that NATO's operations are insufficient, his allies in London and Paris do. There is a solution if the seemingly timid Obama Administration can be brought on board. Fire NATO. That's right - fire NATO. Go back to the initial coalition under American command and control. Then contact the opposition leaders and explain how modern air power works. While it can be somewhat effective without eyes on the ground, it is devastating when combined with trained U.S. Air Force combat controllers. I know, the President has already said that there will not be American boots on the ground. Secretary of Defense Bob Gates has said that there will be no American boots on the ground in Libya as long as he is in office. The President has a choice to make here. The situation in Libya does not have to be a stalemate. He can continue to cede leadership to NATO, he can cede leadership to his British and French allies, or he can reverse course and take charge. If he cedes leadership to NATO, as he currently has, it is almost certain that there will be a long stalemate. If he cedes leadership to the UK and France, the situation could go either way. Mr. President, to guarantee that Qadhafi does not kill more of his own people, and to achieve a stated American foreign policy objective of Qadhafi's removal, get back in the fight. Tell Gates to get on board or go back to Texas A&M. Tell the opposition leaders that if they want to end this, cooperate and get some U.S. special operations teams in there to bring serious air power to bear. Deploy more AC-130 gunships and A-10 tank killers; these close air support platforms can shred the Libyan army. It can be over in weeks. Mr. President, you committed the country to this mission. Now, follow through and get it done. Otherwise, Qadhafi stays in power, and in his eyes and in the eyes of rest of the world, he wins. If he wins, you lose. * While coalition and NATO aircraft have effectively destroyed Libya's centralized integrated air defense system, there are many surface-to-air missiles and artillery systems organic to Libyan army units in the field still in service.